Wangnoo Houseboats are classified Super Deluxe by the Department of Tourism. Our boats are moored on the top sight on the west side of Nigeen Lake, granting a superb view of the Himalayas. Each boat has been built by hand, its exquisite interior intricately carved from fragrant cedar wood and sumptuously decorated using beautifully carved walnut furniture, hand-woven wool and silk rugs, Khadi embroidery and richly colored papier mache items. All provide the guest with a feeling of gracious living which is a perfect complement to the rich natural beauty of the surrounding scenery. 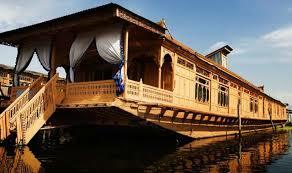 Wangnoo Houseboats is located on picturesque Nageen Lake in Srinagar. The exquisite interior intricately carved from fragrant cedar wood, well-appointed dining room and a scenic view of the lake truly offer a memorable and relaxed stay.